Corn Tortilla - “Mexican Cuisine’s Icon"
If there is a food for which the Mexican food is recognized that is the tortilla. A food that has become a lifestyle , since for Mexicans it is like bread ... it is on all the tables and it is consumed all the time. 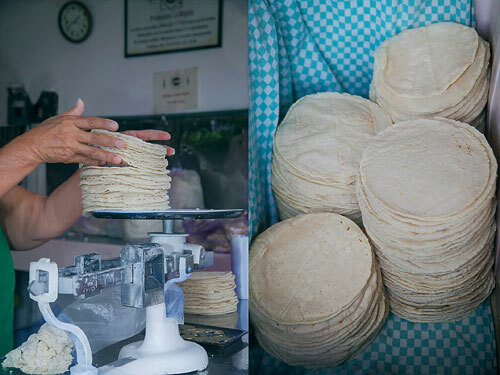 The tortillas simply consist of thin maize dough discs but in reality they are more than that. It is a food that has transcended in Mexico as there is no Mexican that has not ever had a tortilla in his hand, it really is the diet of the Mexicans. They are also used to accompany countless Mexican dishes, simulating bread’s function like: charro beans , Mexican rice , cream of bean soup , chorizo , tlalpeno soup , cecina , salpicon , etc, etc, etc. The tortillas or tlaxcalli in Nahuatl, have been consumed in Mexico for millenniums. In fact there are ancient codexes where the tortilla is shown as food of the Ancient Civilizations . The tortillas are not only food they also act as economic indicators. If the tortilla price rises, something is wrong in Mexico. If the tortilla price goes down everything is great in Mexico. Making tortillas is easy, it is just a bit laborious to make the dough. To make the tortillas is very important to use a tortilla press, in this way the tortillas will come out perfect. This recipe can be made from scratch, by making your own maize flour that is used in these tortillas. Among the cookwares that are used to make tortillas, 2 pieces of plastic are needed. These can be made with plastic bags. The total preparation time is of 1 hour , since the dough is left resting. The recipe is for 20 corn tortillas. Sift over a bowl 2½ cups of corn flour, with a strainer. The corn flour has to be sifted so it is more pure, so it is easier to work with it and to obtain better results. Add in the bowl 1/4 tablespoon of salt. Pour in the bowl, in intervals, approximately 1¾ cups of hot water (14 fl oz) while you work the corn dough with your hands, until it has a soft texture and an elastic and firm consistency. It is very important to feel the dough while you pour the water, it may be possible that all the water won’t be needed. If your corn dough doesn’t come out well don’t worry, it can be corrected. If the dough is too soft add more corn flour, if the dough is too rigid add more water. Cover the bowl with a piece of food wrap film and leave the dough resting for 30 minutes. Make with all the corn dough that was left resting small corn dough balls, of approximately the size of a golf ball; then set aside. If you want to be too precise, the corn dough balls should weigh about 1.2 oz. Put over the bottom plate of a tortilla press a piece of plastic. Over the plastic put 1 of the corn dough balls that was made and cover it with another piece of plastic. Crush with the tortilla press the corn dough ball, until it is thin. Open the tortilla press, turn the corn dough and crush it again, until it is very thin; then set aside. While the corn tortillas are made consider the ideal size of the tortilla is of approximately 5.9’’ in diameter x 2 mm thick. Repeat the same procedure with all the corn dough balls that were not crushed. Heat a griddle over high heat. Then reduce to medium heat and put over the griddle all the corn tortillas that were made, only the ones that fit in without overlapping. If the tortillas stick to the griddle, you can smear some vegetable oil over the griddle so they won’t stick. Cook the corn tortillas that were put on the griddle for about 50 seconds, until some bubbles pop up. Turn the tortillas that are on the griddle and cook them for about 50 seconds, until some bubbles pop up. Once again turn the tortillas and cook them for about 20 seconds, until they are well cooked. This time the tortillas will inflate like balloons. Transfer from the griddle to a tortilla container the corn tortillas that were cooked. Repeat the same procedure with the remaining corn tortillas that were not cooked. Tip: In Mexico when someone is going to take a tortilla from the tortilla container, the one of the bottom is always taken because it is the warmest . Now you know how to take a tortilla. Suggestion: Try freshly made tortillas with lime and salt – it is very simple but very good. Variation: The tortillas can also be prepared with blue corn flour. Did you like the Corn Tortillas? The “Maseca Corn Flour" is the best, is the one that all the Mexicans use to make tortillas. With the “Norpro Tortilla Press" your tortillas will come out thin and ready to go to the griddle. To heat well so many tortillas you will need a large griddle capable of distributing well the heat and you will find this in the “Lodge Pro-Logic Griddle".